← BTMMY’s: Cast Your Vote to Win! Perhaps one of the greatest aspects of Duke’s Grocery is that the Best Thing on the Menu is bound to change; the menu switches daily and is entirely dependent upon what the chefs find at the market that morning. In a refreshing nod to a truly sustainable table, once an item on the menu is sold out, it is finished for the day. On a particular chilly night, the Best Thing on the (ever-changing) Menu: Lomito ‘Completo was a tasty pile of schweinebraten roast pork, spicy sauerkraut, smashed avocado, tomato, and garlic aioli on a brioche bun. A German take on the Chilean fave, it is the perfect ratio of pork to vegetables to bread, with everything cooked to tender perfection. All of Duke’s sandwiches come with a hefty pile of fresh greens to balance the savory meat. Plus, pairing our sando with their extensive craft beer collection left us feeling as though we were in the German/Chilean countryside (that’s a place, right?). The guys at Duke’s have modeled themselves after the neighborhoods of East London, where you’re likely to find global fare like an Indian curry or Bahn Mi, a Vietnamese classic. They have achieved this funky food cultural melting pot admirably, serving items like white truffle mac & cheese (gruyere AND gouda!) alongside hummus (which our Lebanese companions assured us is top notch). It makes for a unique meal. Definitely visit with friends to maximize how much of the menu you can cover in one night. Lomito ‘Completo not your BTM? Post your favorites in the comments section. 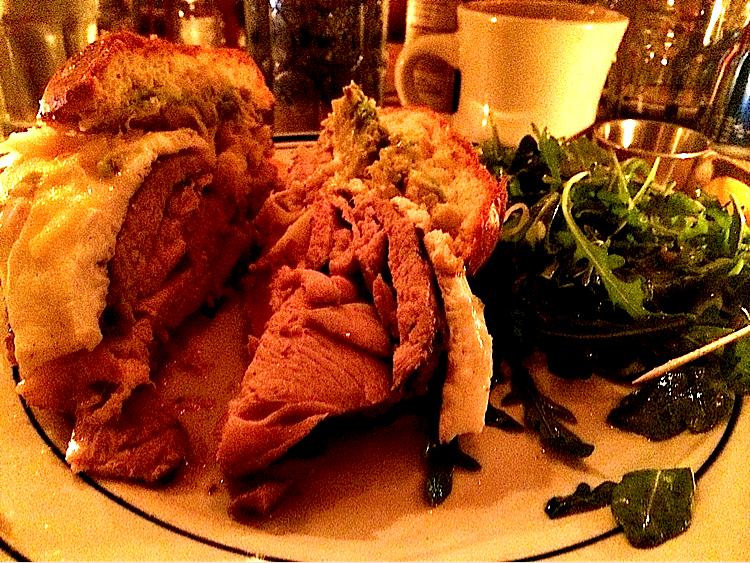 This entry was posted in Restaurants and tagged Bahn Mi, Craft Beer, DC Sandwiches, Duke's Grocery, Dupont Circle, East London, Guest Post, Lomito Completo, Sandwiches, Schweinebraten. Bookmark the permalink. The Banger Sarnie was a nice treat on a recent visit, and the brunch is killer. I can’t speak authoritatively (yet) on what’s “best,” but so far it’s all been great.